2013 Mini Clubman Pros and Cons: Why (Not) This Car? Each of the past three years I've met up with my father for some mountain driving amongst the fall folliage. I can't waste the thrillingly twisty roads of southeastern Ohio and West Virginia on just any car. Gut-wrentching horsepower isn't a necessity. A talented chassis is. So while he drives up from Virginia in his Mazda RX-8, I drive down from Michigan in the most dynamic car I can get my hands on: an Infiniti G37 coupe in 2011, an Audi S4 in 2012, and a Scion FR-S last year. What to drive this year? Well, I've never driven a Mini on roads that posed much of a challenge, and one was available the week in question...done. Actually, not quite done. To the fleet company's surprise as well as my own, the Mini Cooper S Roadster showed up with an automatic transmission. They offered to exchange the Roadster for a John Cooper Works Clubman. No folding top, and far fewer amenities (in the available car), but a more powerful engine. I dithered over which car to take, and ended up putting the question to a vote on our Facebook page. The JCW Clubman won in a landslide, so the exchange was made. With the review, another dilemma arises: which car should serve as the JCW's foil? The Clubman is a unique beast: more compact than all but a handful of other cars, but with a third door to provide access to the back seat. The only other three-door quasi-hatch available, the Hyundai Veloster, doesn't pose much of a challenge. A Fiat 500 Abarth squares up against the even more abbreviated standard Mini, like the Hardtop has only two doors, and like the Veloster (if to a lesser extent) wouldn't pose much of a challenge. Then there's Ford's latest darling among handling corner-carving enthusiasts, the Ford Fiesta ST. If one had been available, it might well have been the subject of this review. Since one was not, it gets the challenger spot. Iffy materials and even iffier ergonomics, but chock full of style. 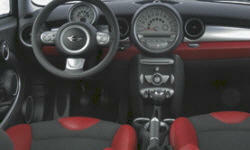 Why the 2013 Mini Cooper Clubman? Minis are pricey. Step up all the way to the JCW and...we'll get to that. For now let's just say that anyone willing to pay the price for a Mini is likely to be an ardent fan of the cars' distinctive and iconic exterior styling. The artful egg of the Fiesta is sleeker and more 21st century. But even in ST form people will see it as just another mainstream hatcback. A Mini is decidedly not mainstream. "My, what an ugly car," my father remarked. The tested car, with a white body, red roof, and black wheels, was not dressed to everyone's taste. Not a deal killer: Mini offers so many other color and wheel combinations that "hundreds" doesn't do them justice. Less easily avoidable: the Clubman has a longer wheelbase and rear overhang than a standard Mini, to the detriment of the Hardtop's perfect (until next year*) proportions. Especially on the driver side, without the additional door, the Clubman's rear side window appears oddly elongated. Continue around the car, and the Clubman's choicest bits come into view: a pair of side-hinged, chrome-handled "barn" doors instead of a top-hinged hatch. Quirky even by Mini standards, these lend the car an extra dollop of visual character. * The redesigned 2015 Mini Hardtop will have a much longer nose to comply with European pedestrian safety standards. This is the first time I've employed a front-wheel-drive car for this trip, for good reason: they're inherently less fun in the mountains. They're nose-heavy, and you can't adjust the attitude of their chassis with the throttle. Unless you resort to extreme tactics, curves won't be enjoyed sideways. For this reason you'll often read that a Mini is "among the best-handling front-wheel-drive cars" rather than simply "among the best-handling cars." And so it is. I had more fun tackling these roads in the rear-wheel-drive Scion FR-S last year. But the JCW Clubman was certainly entertaining, in its own wrong-wheel-drive, point-and-shoot way. The FR-S is perhaps the safest-handling rear-wheel-drive sports car I've driven, but the Mini's handling is safer still. Braking hard into a turn (or hitting a little bit of gravel on a downhill curve) can cause the Clubman's lightly loaded rear end to swing out. Barring these circumstances, the rear tires dutifully follow the fronts, which until they approach their very high limits simply go where you point them, slot car style. By objective measures, the Fiesta ST might stick to the road and maintain an even keel a little better. But the JCW Clubman carves even bumpy corners with encouraging precision, impressive composure, and minimal lean. On top of this, it provides more visceral thrills than the more insulated Ford. The Clubman's steering provides more feedback than the Fiesta's, if still less than I'd like. In the Mini, the steering system's regular mode enhances perceived agility in casual driving. Hitting the "sport" button lends the wheel a heft better suited for the twisties. When exiting corners, you can get back on the gas earlier and harder than in the typical front-driver thanks to highly effective traction management. Either car's relatively compact width (66.3 inches in the Mini, 67.8 in the Ford) comes in handy when the road narrows to the point that the dividing line goes away. Yet due to their steering and their distant windshields, both cars seem larger and heavier than they actually are. This will count as a plus for many people, but not for me. I'd personally prefer an even more direct and elemental feel. Sadly, this isn't the direction the industry has been heading. That the JCW Clubman and Fiesta ST deserve comparison to one another is a compliment to the handling of each. Athletically, the less responsive, less talented Veloster isn't in the same league. White, black, and red plus the split rear doors...there's a lot going on. Note coke ovens over roof. Idiosyncratic controls take some getting used to. Go back a decade, and the engine of choice in a hot hatch was a high-winding four-cylinder. The Scion FR-S continues to be powered by such an engine, but it's now the exception rather than the rule. Both the Fiesta and the Mini benefit from turbocharging. Their engines' peak power is similar to the Scion's, but it arrives at a lower rpm. Of even greater significance, there's far more torque in the engines' midrange, so there's often no need to snag a lower gear and rev the engine. Just push down on the gas and wait a moment for boost to build. The bump to 208 horsepower, courtesy of the John Cooper Works folks, is more than the front wheels can handle in first gear. Wheel hop and torque steer bedevil hard launches. Even in second steer the engine can mildly twist the steering wheel. On curvy roads I rarely pressed the go pedal all the way to the floor. So, while more power is always welcome, the nearly as strong (figure another half-second to 60) 181-horsepower engine in the Cooper S would have been sufficient both for my drive and to go toe-to-toe with the 197-horsepower Fiesta ST.
Then there's the Mini's shifter, which isn't as smooth or as precise as that in the Fiesta. The Cooper S Roadster's unexpected six-speed automatic performed surprisingly well, such that at times I almost wondered if it might have been the better choice. Almost. Even a middling stick is more fun and engaging than a good automatic in a performance-oriented car. In these small performance hatches, you can have both quick acceleration and excellent fuel economy (if not at the same time). Both the JCW Clubman and Fiesta ST score 26 mpg city, 35 mpg highway in the EPA's tests. (The Veloster lags a bit: 24/35.) While the Ford's trip computer reported decidedly lower numbers in my few hours with it, the Mini's confirmed the ratings. In fairly vigorous backroads driving it reported about 27, and when cruising 55-mph rural highways about 35 (one short of the FR-S last year). On 70-mph Interstate the averages fell to 32-33, but this is typical. Even flat-out driving couldn't knock the average much below 20 (again similar to the FR-S, and far above most performance cars). The Cooper S Roadster, with an automatic transmission, has similar EPA ratings. In suburban driving with a light foot its trip computer reported 32 mpg, well above the EPA city rating. With any turbocharged engine, though, use the boost and fuel economy will plummet, in this case to around 20. I could have done without the JCW's power bump. Its brakes provide a stronger justification for the JCW sticker price bump. Even with frequent hard use the JCW-only massive red-painted four-piston Brembo calipers never stop biting hard when you need them to, without feeling touchy when you don't. In instrumented tests these brakes have posted some very impressive stopping distances. The downside of the Brembos, aside from their cost: the spokes of the front wheels soon radiated gray stripes of semi-metallic dust. I've already commented on the safety of the Clubman's handling. But the elephant in the room is the crashworthiness--or lack thereof--of the car owing to its small size. Well, Minis are engineered by BMW like any other current German car. So they're very solidly constructed, and partly as a result weigh far more than people expect. At 2,800 pounds, the tested car is as heavy as the average car one size class up, and not far off some midsize sedans. A deathtrap it isn't. Not that I'm listing "safety and braking" among the reasons to buy because of crashworthiness. This "pro" is all about the Brembos. 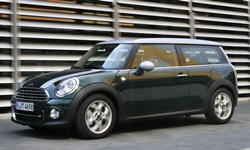 Why Not the 2013 Mini Cooper Clubman? Some people want a car, even a semi-premium performance car, with just the basics. I usually consider myself such a person. But in my days with the Mini, I missed having a nav system (since I was traveling unfamiliar roads). A sunroof would have alleviated the darkness of the interior. The stock audio system sounds weak even to my undemanding ears. And the standard bucket seats are supposedly the "sport" variety, but don't provide lateral support worthy of the appelation. Nav would have added $750. A panoramic sunroof $1,000. The far superior Harman/Kardon audio system (experienced in the Roadster) $750. Satellite radio $250. And heated leather Recaro buckets $2,750. Opt for metallic paint ($500), and it's "hello, $40k!" Load up a Fiesta ST to get similar features, and it lists for $25,780. A Hyundai Veloster Turbo costs about the same. Even compared to the non-JCW Cooper S Clubman (a much better value if one doesn't require track-worthy brakes), either costs much less. Despite the Mini's high price, many of the interior parts look and feel cheap. The body structure feels solid and the doors latch with a reassuring "chonk," though. Everyone recognizes this face. Visiting the coke ovens and falls near Douglas, WV. Small door provides a bit more access to tight rear seat. Even with the rear-hinged "club door, " the Clubman's rear seat is difficult to get into and out of. The Veloster's third door is considerably larger and more usable, while the Fiesta has four real doors. The Veloster also has much more rear legroom than either the Mini or the Ford, both of which are a tight fit for adults. Compared to the Hardtop, though, the Clubman is significantly more practical. I can sit behind my 5-9 self with a little knee room to spare. Rear headroom is abundant. Even if you're not going to put people in the back seat, the extra door eases access to anything you're storing in the rear seat. When traveling in the RX-8, my father and I frequently use the rear doors to stow and retrieve hiking boots and daypacks. The same might be done with a computer bag or briefcase when commuting. Both the Veloster and the Clubman would benefit from a second rear-hinged door, on the driver's side. The Mini has a shallow instrument panel, but its roof extends so far forward that traffic signals are easily obscured and you feel like your driving a box (not the sportiest shape). In the other direction, the frames of the cargo doors bisect the image in the rearview mirror. But all of the pillars are relatively thin, and the base of the windows is low. The Fiesta ST has entirely different visibility issues. Ahead, a tall, deep instrument panel thwarts an intimate connection between car and driver. To the rear, thick pillars and a stylishly upswept belt line pinch the windows. Especially at highway speeds the JCW Clubman is not a quiet car, with plenty of noise from all three sources. A Scion FR-S is noisier still--I despised driving that car on the highway. But the Fiesta ST is considerably quieter. While this reduces driver engagement, it makes for more relaxed freeway cruising. My solution in the Mini: I drove with the windows open as much as possible. Awful ergonomics seem part of the modern Mini's DNA. Few controls resemble those in other cars in their appearance, operation, or location. A bank of toggle switches at the base of the center stack operates the power windows, power locks, and...fog lamps. Two buttons and a joystick aft of the shifter operate a basic version of BMW's iDrive infotainment interface. You turn the end of the right stalk to operate the wiper...unless you want them to operate intermittently. For that, push the end of the stalk. A huge speedometer encircling the infotainment display is too close to actually serve as a speedometer. It's decorative (and will be going away with the upcoming redesign). The role of the speedometer is actually performed by a digital readout in the steering column-mounted tach. I got used to most of these idiosyncracies by the end of my week with the cars. They shouldn't be too much of a permanent bother. But I still wonder, "What were they thinking?" The Fiesta has its own ergonomic issues, centering on the worst implementation of MyFord Touch to date. On top of the usual difficulty operating this system without an unsafe level of distraction, its touchscreen is smaller and farther away. In the Ford's defense, at least its window switches are on the door. As with the rear seat, cargo space is tight despite the elaborate portals. But there is at least usefully more of it than in the standard Mini. A removable cargo shelf raises the rear floor to the level of the folded rear seats. The Fiesta has more cargo volume behind the second row, but less when this row is folded. The swoopier but larger Veloster can haul the most of the three. The Clubman's four-inch-longer wheelbase definitely helps smooth the ride and increase straight-line stability. But I also suspect that its suspension isn't as firm as that of the smaller Minis. It's not clear how the JCW's suspension differs from that of the regular Cooper S Clubman. It can't be much firmer. It might not be different at all. The Cooper S Roadster, with the optional Sport Package but not the optional sport suspension, leaned a little less in hard turns but rode much more harshly. Especially on a long drive that car's constant thump and jostle would have outweighed its slightly sharper handling. In contrast, on back roads with less than perfect pavement (or no pavement at all) the JCW Clubman's ride-handling balance seemed nearly ideal, a reward with every curve, virtually no punishment. On the twisty two-lane roads of southeastern Ohio and West Virginia I gained a new appreciation for the Mini John Cooper Works Clubman. Even the 181-horsepower Cooper S engine would have provided plenty of oomph between tightly spaced curves. The JCW's additional 27 horsepower added more icing to the cake, of greatest use when the route headed uphill. The wagon's handling was both exhilarating and confidence-inspiring, the latter of no small importance on challenging unfamiliar byways. The strong grip of the tires and the even stronger grip of the Brembo brakes provided noteworthy assists. Of course, few of us do much of our driving on such roads. Back in the real world. the Clubman has just enough room for people and cargo to be practical, and its ride is also more livable than that of standard-sized Minis, without sacrificing a significant amount of the enjoyment for which the latter are known. The same can't be said for the taller as well as longer Countryman. Much the same can be said for the Ford Fiesta ST, though the Ford is quieter and largely for this reason delivers a slightly less immersive experience. So why pay far more for the Mini? As well styled as the Fiesta is, it's still a Fiesta, a volume model at the bottom of the Ford line. A Mini carries no such symbolic baggage. Instead, it has a strong heritage as an engineer's, a designer's, and a driver's car rather than as basic transportation. The JCW Clubman's design extends the Mini heritage in an even more iconoclastic direction, without seeming contrived like the Coupe. Not necessarily my thing. But it might well be yours. If it is, get one soon. Now that the Countryman is an option, I wonder if the Clubman, a niche product even for a niche brand like Mini, will be part of the modern Mini's third generation. More power than the front tires can handle in first gear. Nifty split "barn" doors open up to...not much space behind the second row seat. Mini provided an insured car with a tank of gas. Ford held a one-day drive for invited media that included lunch. Some photos by Warren Karesh. 2013 Mini Clubman pros and cons, according to Michael Karesh: the best reasons for buying (or not buying) the 2013 Mini Clubman. Join TrueDelta to post your own impressions.